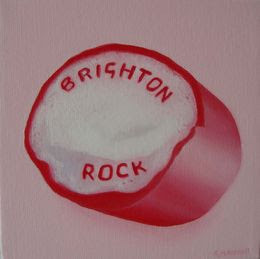 sarah-jane down the lane: Brighton Rocks! 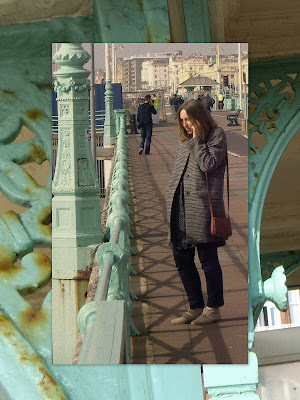 Last week we went to Brighton and it was glorious! The sun shone and in its hazy glow the whole place seemed caught in a retro time warp. I am mad about the turquoise painted ironwork on the sea-front, the slightly faded glamour of the grand hotels and all the familiar film locations. I saw myself on a similar Spring day some 20 years ago sitting outside the same cafes smoking lucky strike and wearing stangely similar clothes...a life-time ago, so much ahead of me...and mostly all good, I gave a nod to that girl...she didn't see me, too busy to notice. I have included Edward Bawden's lino cut of iconic Brighton Pier - it looks wonderful don't you think, with echoes of the pavilion and grand balconies framing it. 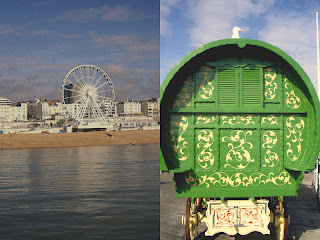 The Persephone Post has been writing about Brighton this week too, read more here. 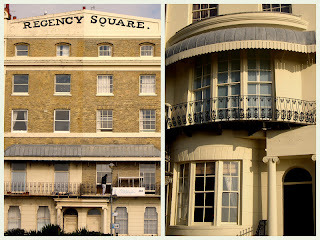 Mulberry shot their SS 2012 campaign here too - looks great, lots of kitsch pieces with ice-cream references. Time to face the grey, wet yomp across the fields with the Boodle, whilst humming tunes from Quadrophenia...what a difference a week makes! i want the gypsy caravan! you even painted it my favourite green! Haven't been to Brighton for about three years. We used to go every year - it is a nostalgic place. I like walking along the front breathing in all that fresh air! I too love the gypsy caravan! 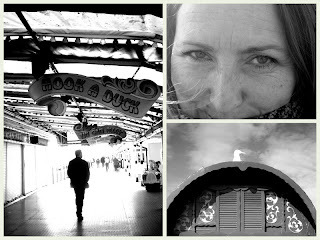 Love this post, brought back memories of a visit to brighton in my student days! I love that aqua colour I was admiring it too last weekend in a lovely walled garden on the wrought iron seating! I've never been to Brighton! DH on the other hand has been often years ago on business trips and since he retired in trips to watch cricket - though strictly speaking I think that's at Hove:) I know he really likes Brighton though and one day I must go with him and explore The Lanes and go inside the Pavilion. Love Brighton. Love Quadraphenia. In fact we saw The Who perform it live at the Albert Hall a couple of years ago. I prefer the film though. OOhhh, ooohh, ooooh, the gypsy caravan! I SOOOOOOO want one of those in my back garden. I think it's because I am primarily a folk painter and I have long drooled over those vans. And it's green my favourite colour. Although I do understand your love of the turquoise ironwork. Thankyou for taking me another trip - its great - don't even have to leave the house. Btw. did you mean Perth Scotland, or Perth Australia. I've never been to Brighton but it looks great, and what a lovely sunny day you picked for it! I have some super blog friends who have apartments in Brighton...so it holds an attraction deeper than even a Ferris wheel could hold!